It would appear that I have been living in these black jeans. I suppose that goes beyond appearances; I have been living in these black jeans. They've been my savior these past few weeks. 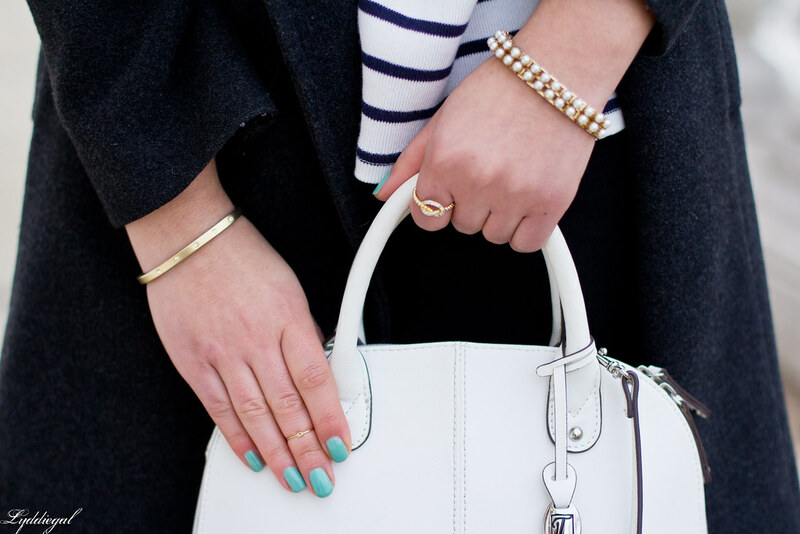 I love paring them with lots of black and white and feeling vaguely Parisian and a bit nautical. 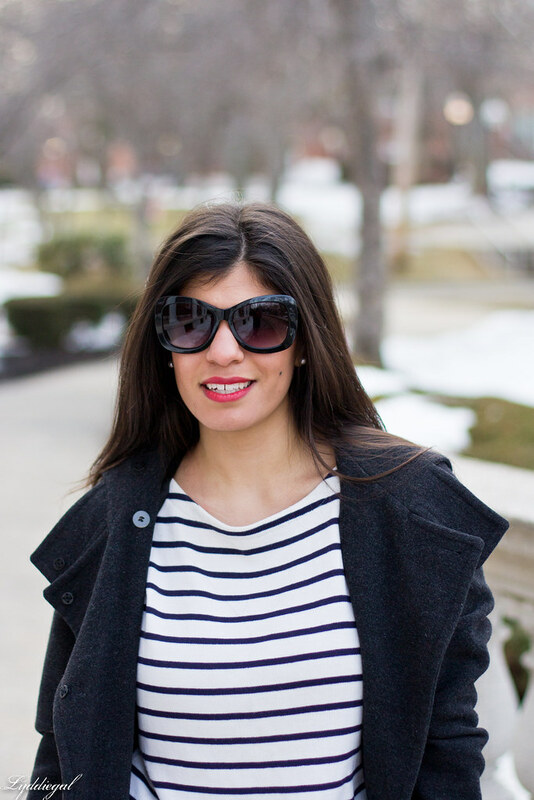 My go-to splash of color for an otherwise black and white look is often a red lip. Jeans are always such a trial, and while I realize different brands and cuts work for different people, I'm so happy to have discovered that Old Navy's Rockstar jeans, in the short length, are perfection on me. They don't stretch out after hours, or even days of wear, and can be had quite cheaply if you pick them up on sale. As far as how well they hold up, the last pair I got is nearly a year old and going strong. It's funny how are simplest looks often turn out to be just as chic as the ones we spend time really putting together! 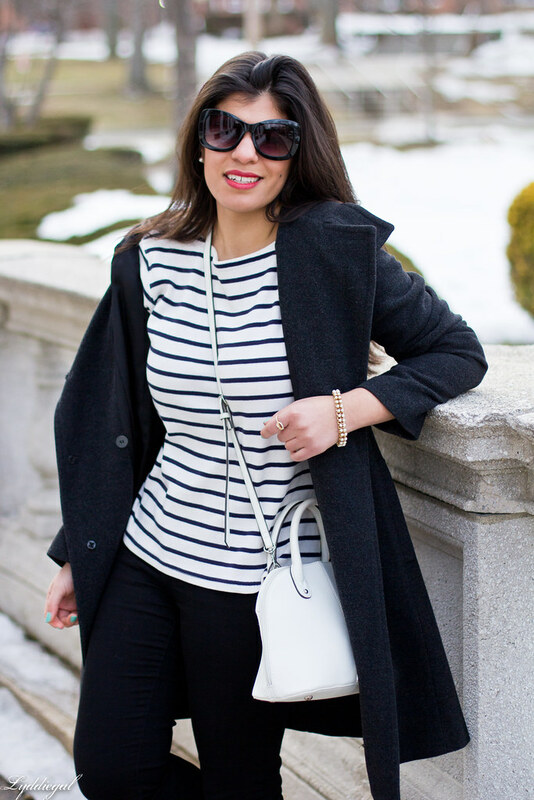 Stripes are always a hit with me and I love the white bag! Isn't it just great when you find a great fitting pair of jeans ? I have to say that I really like how that white bag looks - I have vintage one I dont wear much. I wish Old Navy jeans looked that good on me. Love the classic black and white, so chic. I've always loved how long Old Navy jeans last, no matter how much you wear them. I have a pair from when I was sixteen, and although the style is way dated now, they are still in exceptionally good shape. That said, the one thing I have found in recent years is that Old Navy jeans really stretch out with just a few wears which, no matter how inexpensive they are, is always disappointing to me. But based on your glowing review, I may have to give them another try - you know, when the ten other pairs of jeans I currently own have worn out ;) You know I always love black and white with a red lip, so this look is a definite winner for me. I still haven't tried out those jeans, haha. But I don't really need more anyway...although I'm currently looking at the Current/Elliott sale section because I have $50 off...not too helpful when I'm trying to not spend money! Blegh! Love this look! And I absolutely love the white bag!! Love this look - so simple and casual! That bag is so cute! 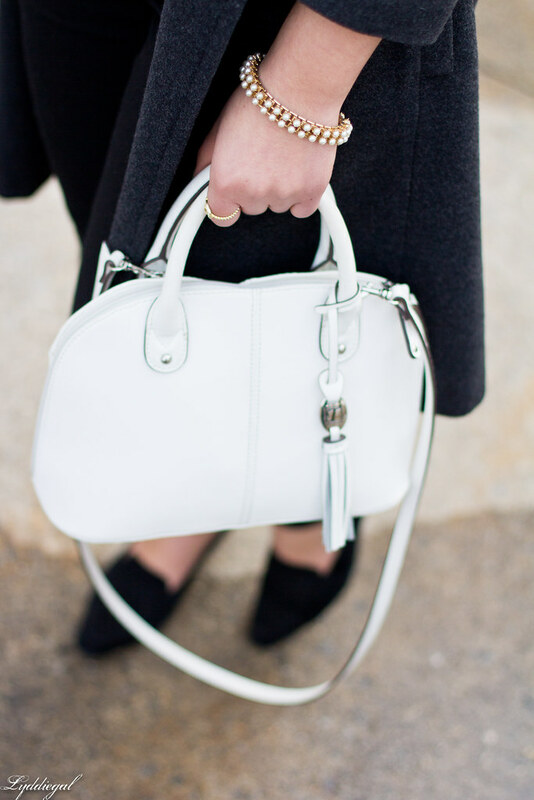 Nothing better then a simple black & white look, this is so chic! Love that bag too. Girl, we are on the same page with the black jeans thing! I've been living in mine too! And I'm loving black and white lately! 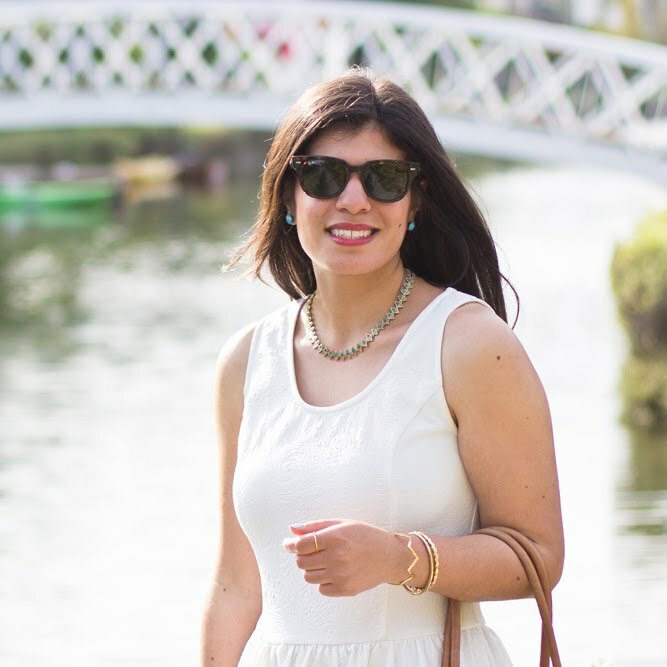 I feel like by pairing white with my black items, I'm more Spring appropriate :) Love the red lips too! I feel the same way about ON Rockstar jeans, they are so awesome for the price! Looking very chic in black & white! The ON jeans never fit me well, I don't know why. Love this classic look. This is such a polished, classic look. You can never go wrong with black and white. I don't have any black jeans...I'm starting to see how versatile they are and that I need them! Good to know about those jeans! I've been reaching for my black pair a lot recently and have been finding they are cut a tad to low in the waist for my liking. I will have to check out Old Navy! Black jeans are so classic! Love them on you! To know about the stretch and the color seems to not of faded at all! 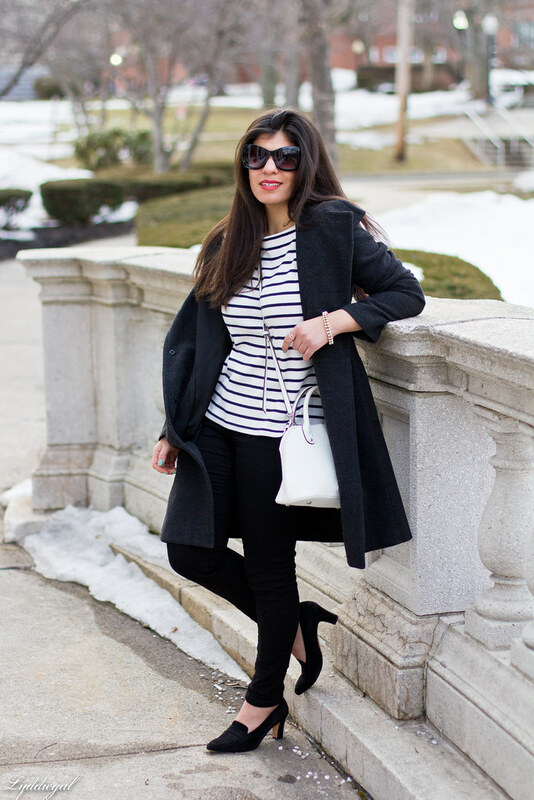 You can never go wrong with a black and white outfit! I want a good pair of a black jeans so I am hoping to get my hands on a similar pair of jeans! I agree - I love Old Navy's Rockstar jeans! They do hold up wonderfully without the dreaded sag, so I have purchased a few pairs of them. This is the perfect chic, casual look. Those loafers are simply amazing! I've given up on jeans completely. (Isn't that basically giving up on life?!) I always hate how they look on me. I feel frumpy. My hips look to wide. Blah, blah, blah. That said, I know I need to find a pair because black pants aren't always appropriate.